Ben Webster (2 june 1864 - 26 february 1947) was a British actor who played Colonel Cyril Egerton in 1909 and 1910 in the play The Fires of Fate. 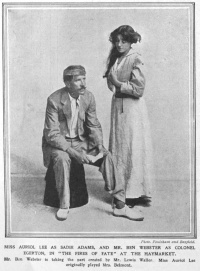 He took the role in London after Lewis Waller while the latter was touring in England. 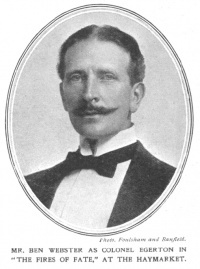 In 1913, he played Sir Charles Temperley in the movie The House of Temperley. This page was last edited on 19 November 2018, at 00:38.